Classes are welcome to visit Gowanus Canal Conservancy’s stewardship center on the Gowanus Canal through the Citizen Science program. 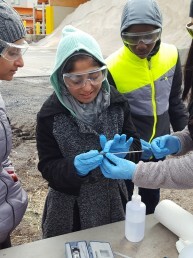 Students will test four different water quality parameters of canal water including salinity, temperature, turbidity and dissolved oxygen. 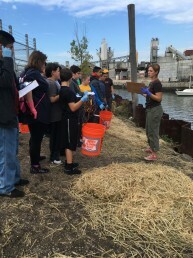 Students will learn how to test each parameter with the appropriate equipment, collect data, and read results using the Gowanus Canal as a field site. 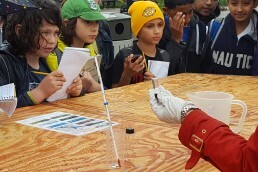 Each lesson integrates the importance of New York Harbor’s water quality and how combined sewer overflow (CSO) impacts test results. Students will also learn how green infrastructure can mitigate CSOs and the role of citizen scientists in advocating for waterways while taking a brief site tour. To schedule a Citizen Science field trip, please fill out this quick form. 90 min sessions, Tuesdays, Thursdays (April-June).